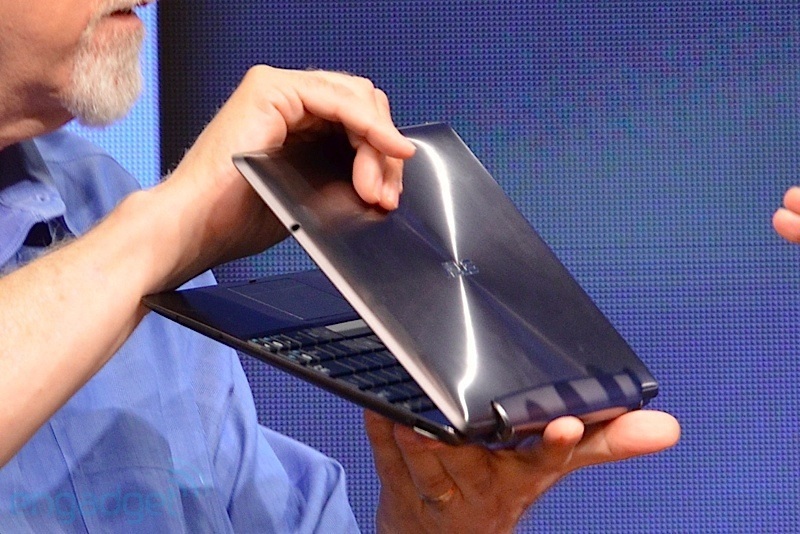 The Asus Transformer Prime will be announced on Nov. 9, said Chairman Jonney Shih at AllThingsD‘s AsiaD conference today as he pulled it out and showed it off. Like the original Transformer, which has been selling well since its debut in April, the Transformer Prime will be a traditional touch tablet, but have a keyboard dock that it can attach to, making it about as functional as a netbook. The new transformer is super thin, measuring only 8.3mm thick, which is thinner than the iPad, which measures 8.8mm, but not quite as thin as the new Motorola Droid Razr, which is only 7.1mm thick. Under the hood, the Transformer Prime will use Nvidia’s new quad-core Tegra 3 processor, features a 10.1-inch screen (standard), and has a battery life of around 14.5 hours with the keyboard dock attached. It also has USB and HDMI ports. There’s no word on if it will ship with Android 4.0 (Ice Cream Sandwich) or not, but we hope that Asus provides an update to the new OS as soon as Google releases the code in November. We’ll find out more on Nov. 9, but for those looking at getting a lightweight laptop for travel, this new Transformer could be a good deal.